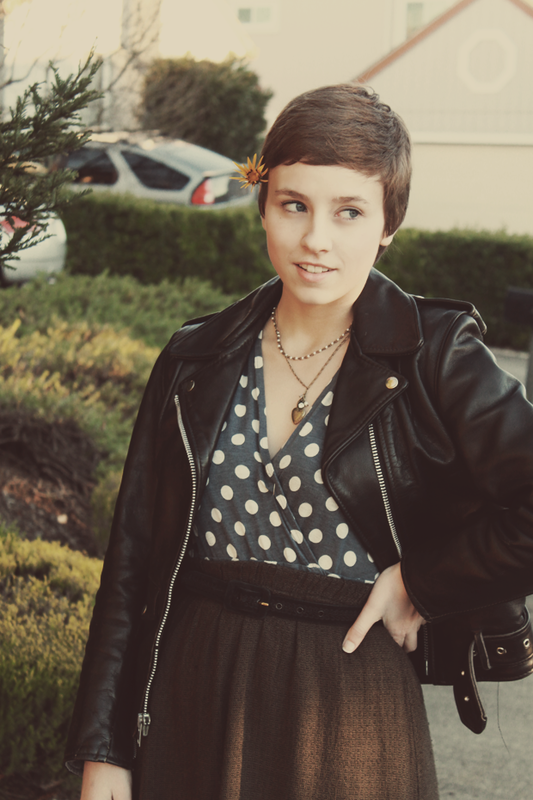 This outfit may in fact be my go-to outfit, as it is said in the blogging community. 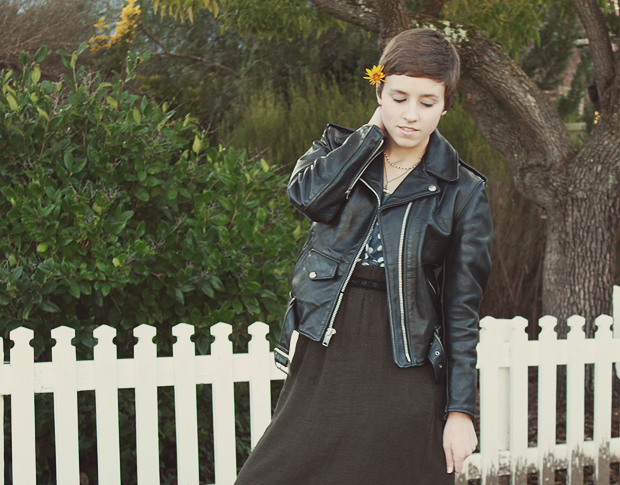 I love how I feel wearing long skirts, plus this vintage biker's jacket. Not to toot my own horn, but I just feel cool. I'm sure you girls know what I'm talking about; even if you don't want to admit it! 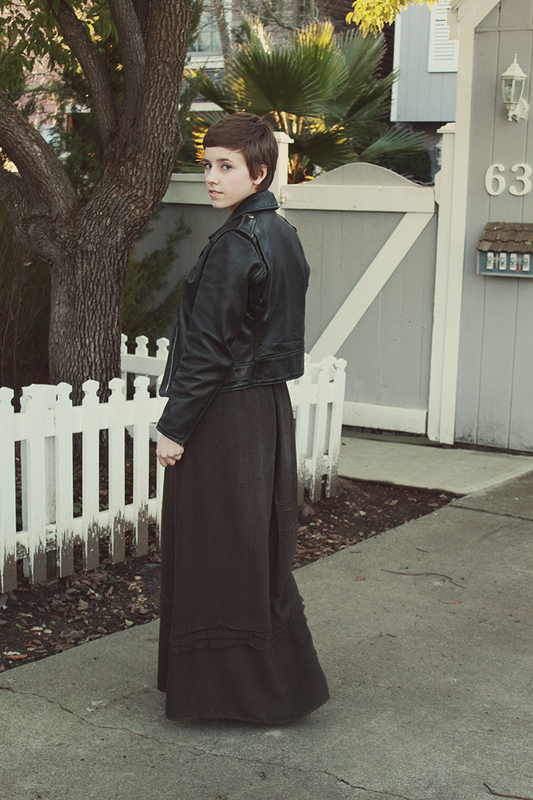 ;) I got this uber long skirt at Goodwill on Saturday and thought I'd style it today. 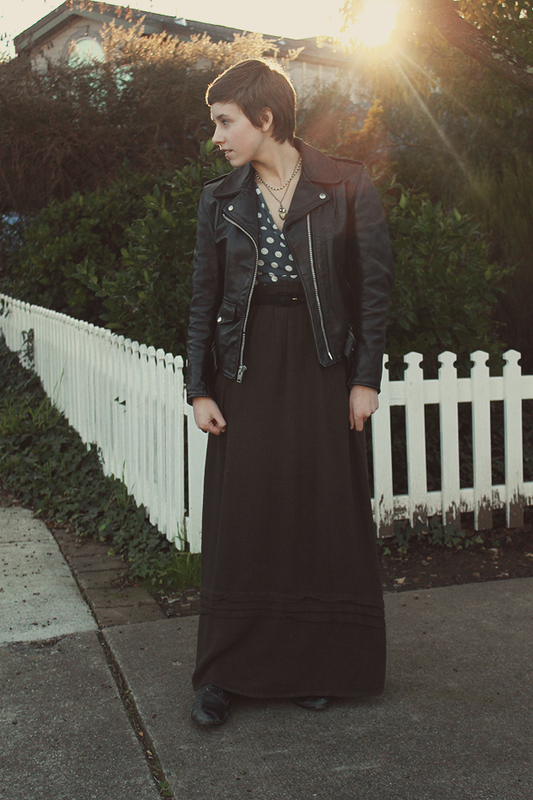 I can't wait for spring - I have a feeling I'm going to be looking for a lot of thin, flowy maxi skirts like this! But anywho, it's February 1st! I'm not all that entirely excited for Valentine's Day as my readers know because of the current situation in my live - but maybe I can find a way to enjoy it any way! Who knows... Maybe I'll just buy myself a box of chocolates? Yeah. I'll do that. You look so very cool indeed! 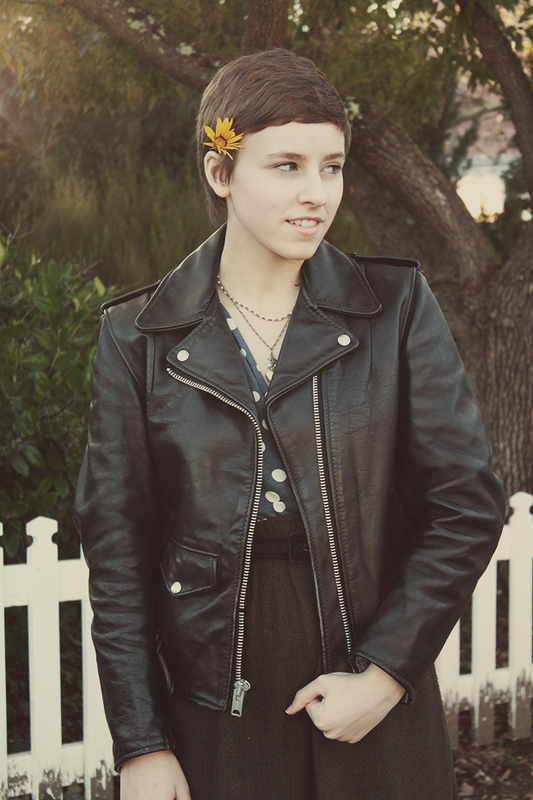 I love the leather jacket, it gives your outfit such an edge! Your hair cut is so cute! I'm inspired to cut off my locks and trade them in for a more posh doo! Adorable blog! This is a look I could never pull off but gosh you look great!! I would love for you to just try new stuff on your blog...if it doesn't work then on to the next thing! I love the polka dots! You look so pretty, and I love your outfit!! Girl, you look so good! You look older too, in a good way! What a lovely outfit! 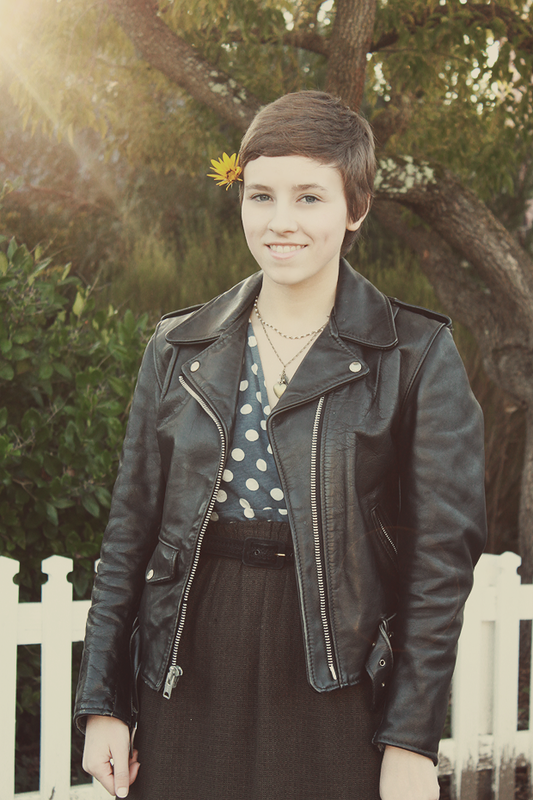 I've never really enjoyed wearing maxi skirts, my self, but I love leather jackets! Mine is totally one of my most used go-to pieces, and yours is really great! It's funny, the first thing I thought when I saw this outfit was, "she looks so COOL!" and then you said that you felt cool in this outfit, haha! This really is a wonderful outfit, and totally makes me want to try out longer skirts! So lovely and perfect! I find this such a daring outfit and you pull it off so easily! You look wonderful! 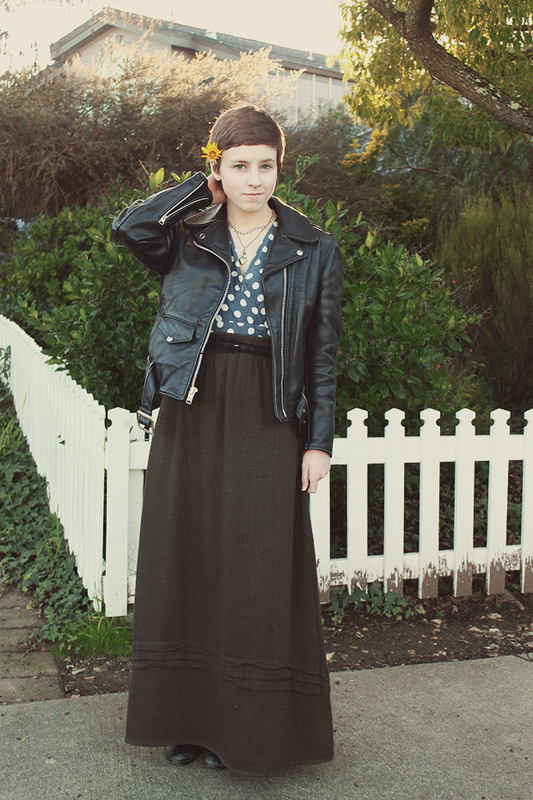 Looks great - the jacket is the perfect partner in crime for this skirt. This look is totally cool!! I love it! 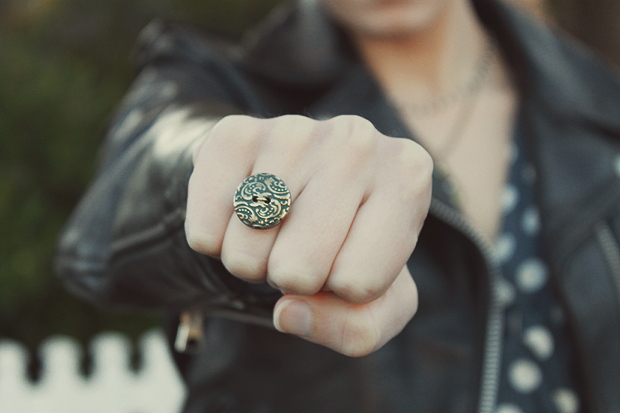 And I think that blogs that offer more than just clothes are awesome. You learn and appreciate that person more rather then just a catalog model appreciation. Do it! This skirt is great! What an awesome find. :D You look very cool, and when you feel cool it makes you look even cooler, you know? Also, do you have any single friends to celebrate Valentine's Day with? That's what I always used to do :) And we'd buy each other chocolates. And you should definitely write about whatever you like! Such a great look! I love how everything just works soo well together. It's definitely a lovely go-to look. wow, u got lovely photos! 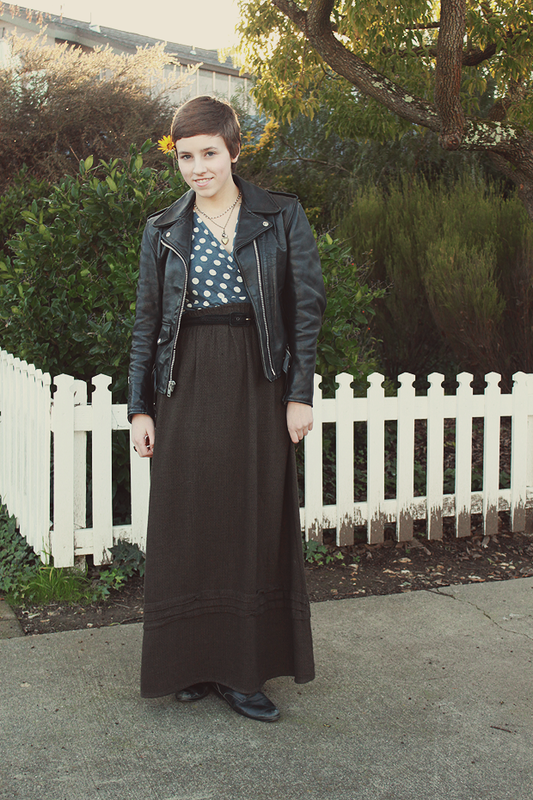 This is a completely cool ensemble:) I love that you can pull off a biker jacket with a long pretty skirt and sweet little flower in your hair. I do love the proportions of this outfit! 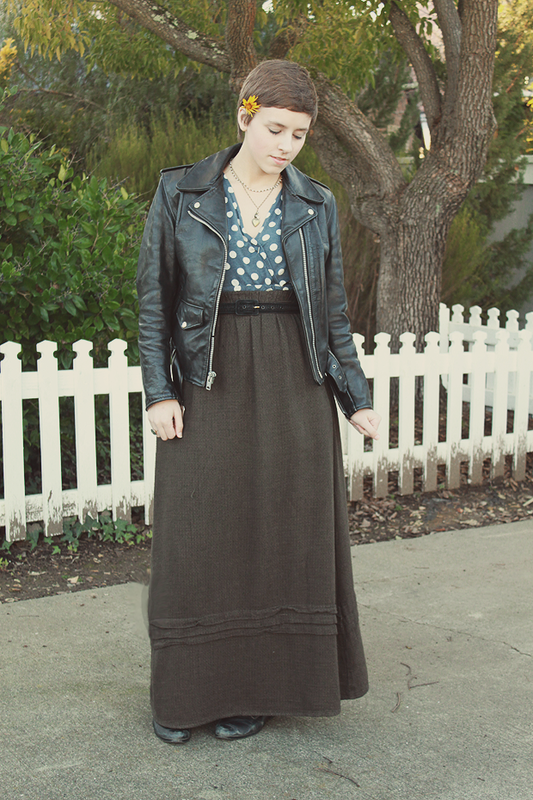 I am terrified of long skirts, but how cool you look in them makes me want to try them out! I'd totally be interested in a music column as I am always looking for new music to listen to and bands to discover. And from peeking at your "currently listening to..."s, we have similar taste in music! © 2018 Moth Speaker. All personal photographs and content are property of Moth Speaker. Do not copy or reproduce without written consent. All rights reserved. © Moth Speaker 2010-2018. Powered by Blogger.